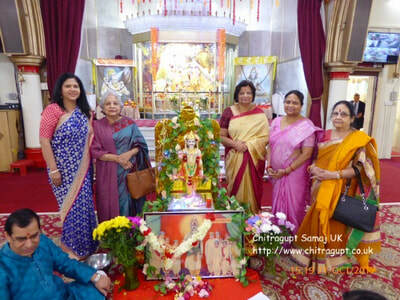 CHITRAGUPT SAMAJ (UK) is an organisation founded to maintain and promote the traditions of 'Kayasthas' in U.K. According to Hindu mythology, 'Kayastha' was the name given by Brahma, the creator of this Universe to a figure who was born out of His body (Kaya). 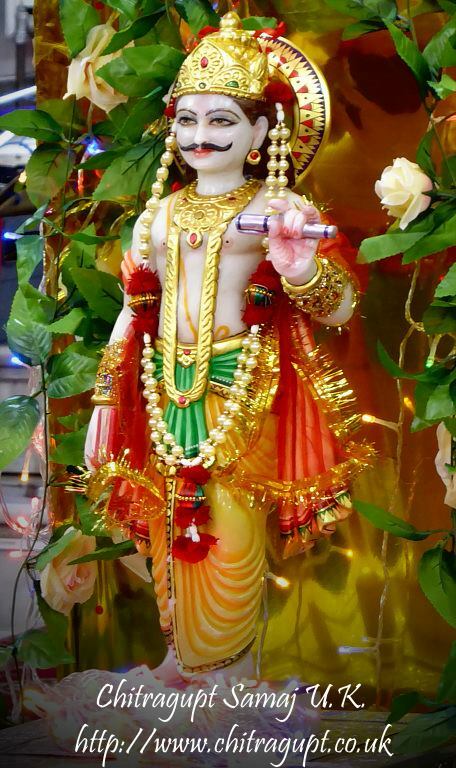 Brahma gave the name of 'Chitragupta' to this individual and his progeny on this earth are known as 'Kayasthas'. Brahma allocated Chitragupta the duties of keeping an account of everybodys good and bad deeds on this earth, in the offices of Dharma Raj, situated in Yampuri. These were obviously taken into account after the death of an individual for allocating his or her next life or granting 'Mokasha' i.e. Liberation from the cycle of rebirth and death. Thus traditionally the 'Kayasthas' have been pursuing careers related to accounting, literary activities and other academic professions. Promote traditional values, specially hard work, honesty, and ability to adapt to varying circumstances, among the youths of Kayasthas and the Hindu community at large. Promote spiritual values along with formal educational activities, so that youths of today, develop as good human beings in a multi-cultural society. You all will be pleased to know that the 35th Chitragupt Puja was celebrated with traditional fervor and zeal on Saturday 10th November 2018. We’d like to extend a very warm welcome to everyone taking part in this year’s festival, making it a wonderfully creative and diverse event. As always we have many talented young people from the UK Kayasth Parivar and we are convinced that once again in 2018 we will be showcasing talent of the highest quality. Please contact Dr. Shreeja Sinha (email: shreeja@btinternet.com) if you would like to participate in the cultural programme. A faith organisation, Hindu council, forum, community to celebrate, maintain promote cultural traditions of Kayasthas in Britain.